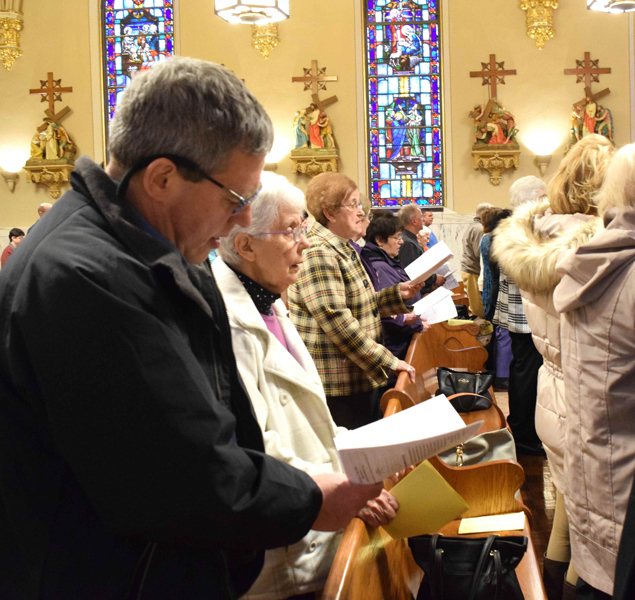 The message of 1 Thessalonians 4:13 tells us to grieve with hope – the hope of the risen Christ – and is at the heart of We Are Remembered Ministry, which celebrated its 27th Annual Easter Mass April 4 at St. John the Baptist, Allentown. “We gather on this Wednesday of Easter week. 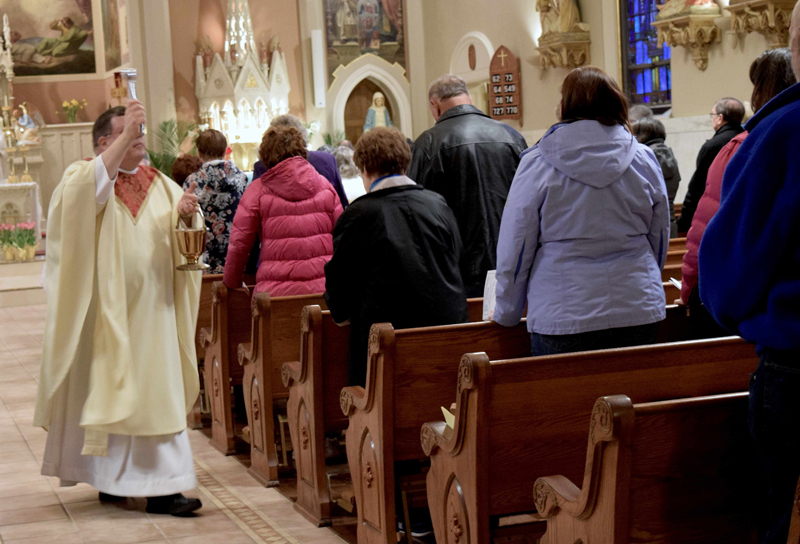 In the Easter Octave, each day is a celebration of Easter, which cannot be contained in one day,” said Father Martin Kern, principal celebrant and homilist of the evening liturgy and pastor of St. Columbkill, Boyertown. 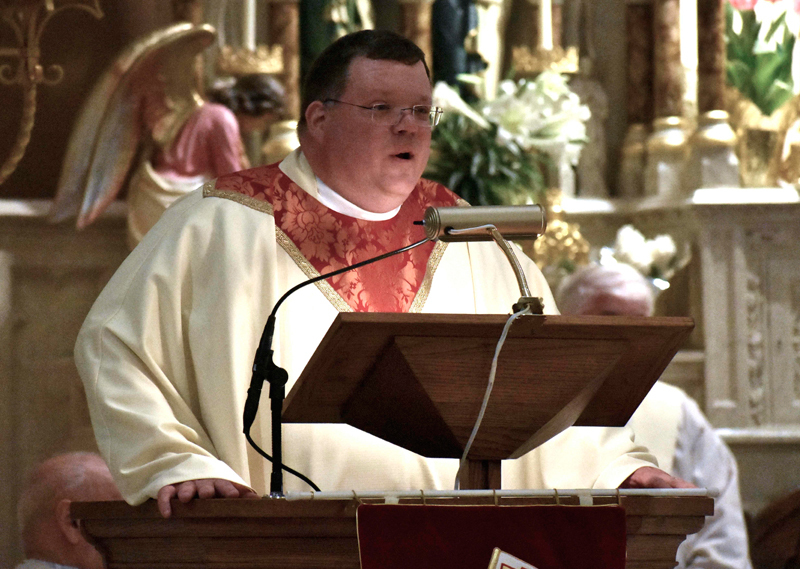 Concelebrating were Father James Torpey, advisor to the ministry and instrumental in its founding in the Diocese of Allentown in 1991; Barnabite Father Dr. Robert Kosek, administrator of St. John the Baptist and SS. Peter and Paul, Allentown; and Father Luigi Palmieri, retired to Holy Family Villa, Bethlehem. Deacon William Urbine, who serves Notre Dame of Bethlehem, assisted. We Are Remembered ministers to all faiths, parents who have lost a child and all who have lost someone to death under tragic circumstances. All who grieve the loss of a family member or friend are welcome. 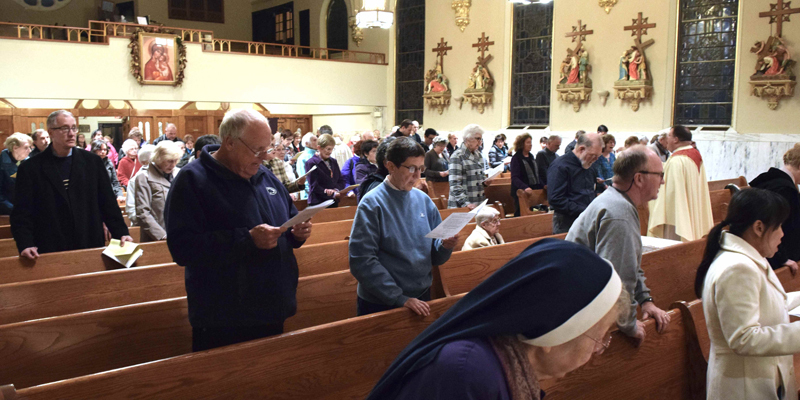 A total of 574 names were enrolled and remembered at this year’s evening liturgy, which drew a gathering of approximately 157 people. Rich and Eileen Badesso, and choral members of Sacred Heart, Bath provided music, including the beautiful song “We Are Remembered,” which Rich Badesso wrote and dedicated to the ministry more than a decade ago. Remembered obtained the flowers from Hickory Grove Greenhouses, Catasauqua and its proprietors, the Eline family, who themselves lost a child. Before and after Mass those gathered had the chance to sign the Book of the Remembered and write a note to their loved one. In a homily laced with words both spoken and sung, Father Kern referred to the evening’s Gospel, Luke 24:13-35, the story of The Road to Emmaus, the Gospel which is always part of the annual liturgy. “Today we walk with those two disciples to Emmaus. They walk with all of us who grieve and mourn,” Father Kern said. “Like Cleopas and his friend, we at times stagger in our grief and wonder why our loved one was taken from our midst. Father Kern said Jesus is with us in ways such as through the doctors and nurses who care for the dying, and the compassion we extend to one another, especially in the We Are Remembered ministry that evening. “Tonight we have come to break the bread. In this Eucharist, Christ is present,” Father Kern said. “At the altar tonight heaven touches earth. We’re on our own journey to heaven, and along the journey we need Jesus. What is We Are Remembered? Father James Torpey is advisor to the ministry. Rich and Eileen Badesso coordinate the mailings/enrollment of names, and provide music for the ministry, available via iTunes. The late Bishop Thomas Welsh allowed the ministry to begin in the Diocese. It works in cooperation with the Diocesan Secretariat for Catholic Life and Evangelization. For more information, write to We Are Remembered Ministry, P.O. Box 20082, Lehigh Valley, PA 18002-0082. Those gathered lift their voices in song at the evening liturgy. “We gather to celebrate Christ’s victory,” Father Martin Kern says during the homily. Father Martin Kern performs the sprinkling rite. The congregation sings during the Mass as Father Martin Kern performs the sprinkling rite. 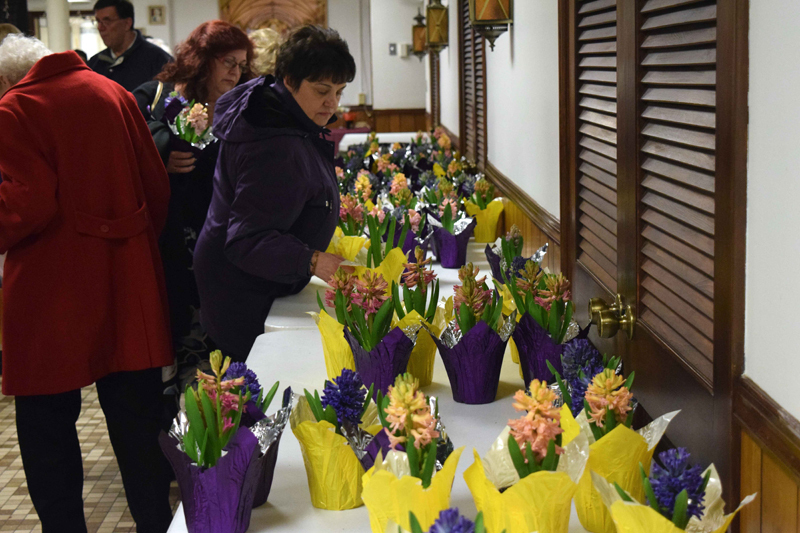 Those attending select a beautiful spring flower to take home.